Hosted a series of Animation Workshops in conjunction with Design Camp and the Contemporary Art Museum. This was the first time that a digital animation component was introduced into the Design Camp disciplines and we hope that it will be a sure hit as an additional feature in the future. We had a fantastic time trashing the lab and creating some exciting stop motion animations as well as a quick stop action short film. We featured non-stop sessions of storyboards and concept sketches, fruit-loop fights, mock-ups and enthusiastic budding directors. With a lot of help from the event organizers, student TAs, camp counselors and featured returning faculty member Ryan DeWitt we were able to do a 5-day workshop and showcase 80 student animations and 5 short film animations on the final Saturday Design Camp Reception. A big thanks goes out to Nicole Welch and Pablo del Valle for helping us organize the events, keeping us on track and stocking us up with supplies! 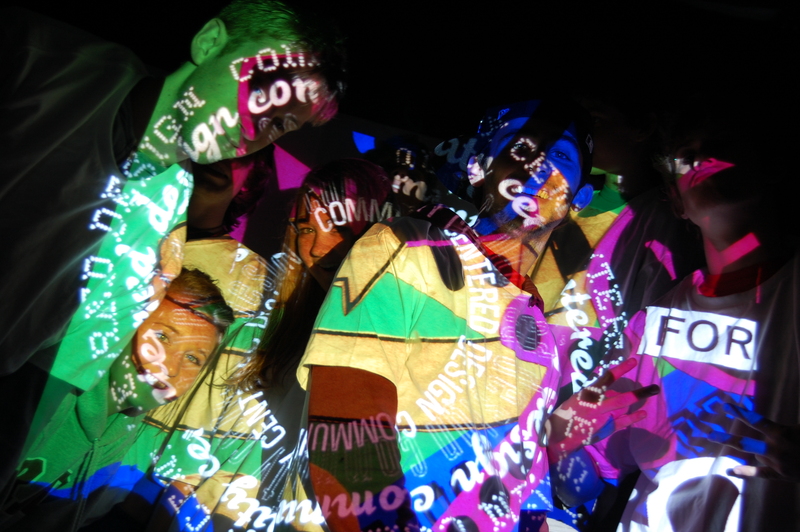 Not to be outdone, Santiago Piedrafita – Chair of the Department of Graphic Design at NC State University College of Design introduced future design students to the art of Typography and projected light. Emphasis was placed on the process of exploring a visual composition in studies of scale, layering, opposition and tension using graphic pattern, icons and typography. After projecting it at a large scale it allowed students an opportunity to see how layering, juxtaposition and scale change the graphic form and meaning. For more information about Design Camp check out cam.ncsu.edu!